If Childrens Pure Laughter and Happiness Is the Gift you wish them to have; Cherry the Clown is blessed with the unique talent to create, deliver and make it happen. Cherry The Clowns entertaining Pre School shows are crated specifically with material best suited for the age group . Laughter is said to be the best medicine and Cherry the Clown delivers the right dose. Auckland Clowns offer the best educational/entertainment shows for pre-schools, celebrating birthdays, open days, Christmas functions and special events. ​Coming up time for a Christmas treat, Birthday Party or special event? Auckland Clowns offers the best Kids Entertainment. Funny Clown Shows, Magic Shows, Balloon twisters, Santa and Stilt Walkers. For those who just want to sit back laugh, giggle and be entertained by Aucklands funniest clown. Comedy, Magic Show, Juggling Show, Funny Puppets and Balloon animals. A true funny clown show, in the circus tradition, that will be remembered for many years. 35mins $ 160, or with balloons for each of the children the cost is $ 200. 2) A Special Educational Show For some who may be unsure. From $190. The Educational show; make up put on, fun filled comedy clown show, laughter, happy memories and the creation of a special balloon animal for each child. Its Best to let you read what The teachers of Pre Schools say as this is the best advertising one can get. Cherry provided our large group with an hour of non-stop laughter! From the informative putting on the make-up and ‘dusting off the doldrums’ the children were captivated. His manner was calm, respectful and genuinely orientated to the pleasure of the children. To have each child presented with an individually crafted balloon was special. Thank you!’ Waipawa Kindergarten. Merry Christmas! Ann & Team. 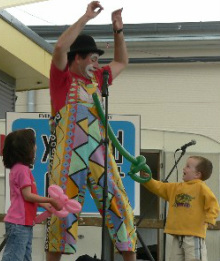 We have had the pleasure of being entertained by Cherry the Clown a few times now and wouldn’t hesitate to recommend him for any Kindergarten looking for a reliable entertainer. His shows are very specific and his transformation show is a real hit. It is sensitive to those a little fearful of clowns which demonstrates Cherry's empathy and understanding of young children. 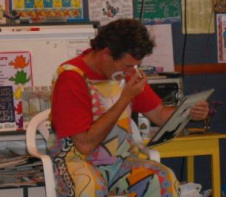 I especially like that his shows are for the children with content directed at them and not the adults. He is interactive, very funny and non threatening. He is reasonably priced, reliable and a very easy man to communicate with. We just love him here at Sturges Road Kindergarten! “ I really loved the way he explained to the children about clowns and showed them how he became one in such a easy and enjoyable way. You could see those fearful children relax and even the very young siblings enjoyed his clowning around” Comment from a parent. “ He’s a silly clown and made me laugh. He’s a nice clown, not scary.” Comment from a child. Your show was great because it allowed our young children to experience the process of transformation from a person to a performer. This was a wonderful learning experience that felt safe for those children who were initially uncomfortable at seeing someone who looked so different to what they were used to. It is an excellent base for ideas about diversity and acceptance of difference, and a great deal of fun. The children roared with laughter and were very pleased to have a special balloon to take home with them. We hope to see you again. 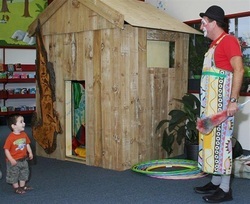 The children at Belmont Kindercare thoroughly enjoyed ‘Cherry the Clown’. The show was very age appropriate with lots of fun experiences for all the children. The fact that we saw ‘Cherry’ put on his makeup helped those children who would otherwise be a little unsure of ‘the clown’. Overall, there was a lot of laughing and everyone had fun. team. What impressed us was as follows. The fun variety of your presentation really connected with all our children. while really making then laugh. All our teaching team really enjoyed your way of communicating at a level that ensured the children were fully engaged for the hour you were with them. The balloon making of animals at the closure was fantastic and all the children were happy to wait in line for their turn too. We have no hesitation in recommending your show to other Early Childhood Centres. Cherry is serious about his young audience and will do his best to make sure even the smallest of the smallest are happy; its all in the approach. After 20 years Cherry sure knows his stuff. Cherry has obtained a letter from the Ministry of justice to show he has no criminal convictions to give peace of mind to employers, parents and care givers and urges you to google the entertainers names for references on their character and professionalism.